This photograph was taken in Omaha c.1920 and shows a display promoting the work of the Massachusetts Society for the Prevention of Cruelty to Animals (MSPCA). The display board is full of promotional material about the work of the MSPCA and includes posters, pennants, and material from Our Dumb Animals. 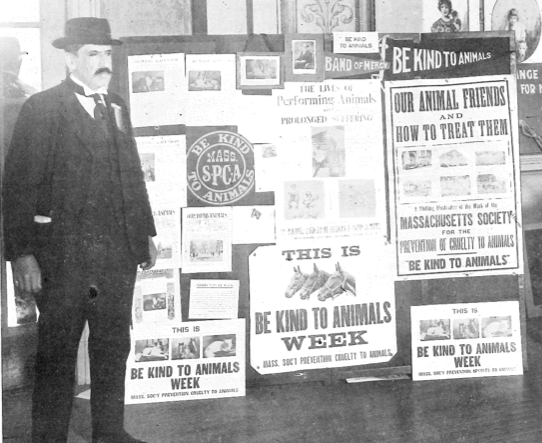 On the far right of the display is a poster that contains the words: “Our Animal Friends and How to Treat Them.” Under this phrase is a series of 6 images, described as a “striking illustration of the work of the Massachusetts Society for the Prevention of Cruelty to Animals.” These kinds of displays were an important way to make visible the work of animal advocacy groups. Humane Education exhibit in Omaha, 1920. Photograph published in Our Dumb Animals, 1921. Collection of MSPCA Angell. At the bottom of this display is a sign features a depiction of 3 horses incorporated in to the message “This is Be Kind To Animals Week.” This is an example of the kind of sign that would often be affixed to carts and wagons during Be Kind to Animals Week®.